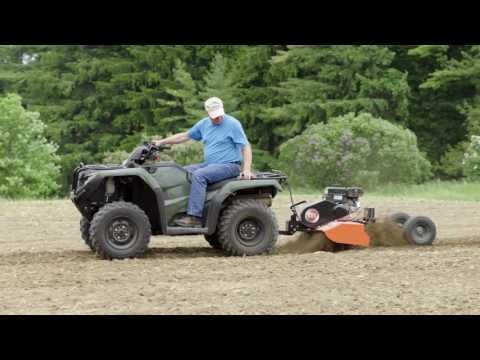 Tow the DR Tiller behind your ATV, riding mower, or tractor and you'll break ground and turn soil faster and easier than you ever thought possible! The DR does the hard work while you ride in comfort and adjust the tilling depth by remote control. Unlike walk-behind tillers, the DR® Tow-Behind Tiller doesn't divide its engine power between moving the machine forward and turning the tines. The full power of its overhead valve Briggs & Stratton engine (9.50 ft-lbs gross torque) is dedicated to the real task at hand, tilling the soil. Your tow vehicle takes care of the propulsion, and with its weight, actually holds the tiller back to create maximum churn (and prevents the tiller from lurching forward as walk-behinds often do). The result is the DR® Tow-Behind will till unbroken ground, including tough sod, in a fraction of the time required by any walk-behind tiller. Even better, it is twice as wide as most ordinary tillers and applies twice the tine coverage. That means faster, more thorough tilling, with none of the strain associated with tillers that require sheer strength to control them. Instead, you just ride and relax. Battery-powered actuator controls tilling depth by remote control. The Actuator raises and lowers the wheels, which in turn raise and lower the tines. A holding force of 250 pounds assures the tilling depth remains where you set it. The Actuator is powered by a 12-volt, 17-amp battery that will raise/lower the machine over 100 times on a single charge. The Remote Control allows you to make precise adjustments to your tilling depth without leaving your towing vehicle. The tires are pneumatic and 14" in diameter and 5-1/2" wide for easy rolling during transport. Dimensions 14" x 5 1/2"
Very nice used it once. Started up fast and never bogged down at the lowest setting. I installed a rubber mat on the back so the dirt will not shoot out. I wish it had a 3 offset bracket so it could dig deeper. Overall I am very pleased that I switched from the walk behind to the tow behind. This is a great little machine especially for getting back in the woods to create a food plot. It tills the ground really well for a perfect bed for your plots. I highly recommended this product. Tilling 1 1/2 acres new ground and after the second pass I'm down 3-4 inches. Works like a charm. Tested it on our farm yesterday. It was a beast it tilled our soil with no problems. Will recommend it to all other farmers in our area. good unit but my ground is taxing it breaking shear pins, not getting very deep, one concern; air cleaner was messed up bad when received could not get grease out of filter. Response from DR SupportThank you for your feedback. We certainly apologize for the air cleaners being of a concern. We are sending to you replacement units. The Roto Hog is a really great tiller and we know you'll be pleased with its performance. Gardening is especially satisfying and having good equipment is important. Let us know if we can be of any other help and we want to thank you for choosing DR Power. We appreciate your business! Easy to use. Read the directions and go to work. I tilled a plot in ninty minutes that took eight hours with a walk behind tiller last year. This tiller is a real work horse and it will do a excellent job. Just read the directions. Easy to assemble. It was hard to move after just the first running had to take it Apart and oil mech dirt grit got I between the mech Causing it tone very hard to move . But other than that it is great piece of equipment love it. I am a disabled veteran and for the past few years have not been able to plant a garden because I can't walk long enough to prep the seed beds and the rest of the normal chores of gardening. Thank you DR! I am now back in the garden. Without the tow behind tiller I would not have been able to prepare the garden again this year. We are looking forward to a bountiful harvest for the first time in years. I bought the Pro Model electric start model in February 2014. I also got the hiller attachments. I've tilled up two plots so far. One is approx. 30x55 and the other 20x90. The ground here is very rocky and the roto-hog didn't seem to have any real issues with that. I took it slow only digging in small increments due to the rocks. After each pass I removed the rocks and made additional passes until I got to full depth. I found the machine very easy to use and my Cub Cadet 46" lawn tractor handled it very well. Using the hiller attachments was even easier than I thought and I highly recommend the purchase. For the cost they are a steal! I'm very impressed with the tiller and the over-all quality. It's well made and easy to use. I wasn't happy with the choice of a Briggs engine as past history with them has been very unsatisfactory. However, with the electric start it fires up each and every time and runs smooth and strong. Using the tiller takes a little finesse but just take it slow and listen to the engine and you can't go wrong. DR has been very helpful with everything. I would recommend purchasing their package of extra shear bolts! Have been using this machine on 4 acres of hardpack with numerous smooth rock from marble to bowling ball size for 5 years. Don't expect you will unload this machine and till 4 acres in an hour. Patience with numerous passes to achieve maximum depth is required. Handpick rocks after each pass or risk replacing shear pins. Drag stakes absolute necessity until cultivated to maximum depth otherwise tiller will push the (lawn tractor - 12HP or more recommended - and stalling will be more frequent. Right angles to previous pass beneficial in initial breakup of new plots. Hiller works well, but removing the shields to accomplish the swap is not a streamlined process. Spreader is honestly reviewed in other's comments - the electric engine is underpowered, but flipping the toggle switch on the controller while having the machine rolling eliminates most of the frustration. Fresh fertilizer (not previously stored) also makes a huge difference. If it is caked or aged, prepare to want to start drinking. Even 4" of extra length with a bend towards the tractor would make engaging/disengaging the tiller a more streamlined process. The 'shock-absorbing hitch is a lifesaver. Draining the oil is best accomplished with a suction pump - available from DR. The 36" tilling width is nice, but with forethought... and planning a 5 foot row width for cropping will get you past the weediest part of the growing season while still being able to use this machine to save labor. It is not friendly to back up as the hitch to wheel ratio compared with the 4-wheeler or lawn tractor are not compatible. However, with small tweaks of the steering wheel, you can put it about anywhere. Some criticism of the large turning radius is mentioned in other reviews. Can't argue that, but plot planning and patience can eliminate 90 % of the frustration. Recently discovered that plowing perpendicular to the crop rows on ONE pass at the ends eliminates the piles of dirt left when the tiller is raised or lowered at the end of the row. Not sure the elevation where this machine is made & tuned, but my location is at a mile above sea level. A carburetor kit for high elevation and a professional adjustment turned this tiller from a dog to a darned pleasant machine to run. DR has been extremely responsive to warranty issues. Although it was a well built machine i feel its a bit under powered i used it in sandy soil and it still struggled and stalled out several times. i almost sent it back on the six months trail, but kept it because all in all it did the job, by being very easy on the machine. i did however think i was getting a powerful machine that could rip though concrete the way its advertised. i decided to keep it because its the only machine that i could find of its kind. i ordered the whole accessories pack and was very displeased with the spreader opt i still have not got it to work. it keeps clogging up and the weight of the fertilizer causes it to seize up. so if you by it be sure to have a disc to break the surface first or you will be dissatisfied. and forget the spreader its useless to date. don't think i would recommend it unless you have no other options. Tows well behind ATV over rough terrain and up steep hills. It took about 3.5 hours to till a third acre plot of heavy sod and clay. Broke a couple belts and shear pins but were easily replaced. Seems to be quite durable and easy to use. Used a plot master previously and compares favorably. It will enable me to put in food plots in very remote areas. Patience is a MUST in clay! My large garden (150' x 80') is all clay. I used to use a old compact tractor with a disc. When the disc broke the poor ol' tractor didn't have the strength the lift new discs. I researched the Roto-Hog and eventually bought one. I must say I thought I made a mistake at first. You should use the ground stakes with Hydostatic garden tractors. It does take time, alot longer then the disc used to. However, it will bust it up and eventually turn the clay into flour consistancy. Even better then the disc used to do. I found the best method was to lower it until it starts to grunt a bit and then pick up the speed. Yes, speed up. Once you get the first 2-3" loosened, then you can slow down and really dig deep. Another thing is to make passes where you over lap half of what you just tilled. Be preparded to replace shear pins, they do break often at first. BUY EXTRAS. Overall it is a good machine. Strong componants. BUT it is a slow process in tough cement hard clay. Introducing organic matter will help eventually. Find a farmer and till some manure into it in the fall. I also got the hiller attachment. Going to use that just before I plant. With the soil depth at a full 7+ inches, I look forward to nice BIG hills. Doesn't do any more than my walk-behind tiller! We bought this for our garden and for putting in food plots. It does a fair job at tilling already-been-tilled gardens, but you have to go so slow as to take forever. We definitely couldn't use it behind our ATV, as we couldn't make it go that slow. We ended up having to hook it up to our lawn tractor, which is geared to go slower. Even then, it kept bogging down and killing. Then we tried it on a food plot that had already been tilled before and one that was virgin sod. No go for either one. Shear pins kept breaking off and we had to till the same ground over and over, one inch down at a time, to get it to till properly without stalling out or shearing off pins. We are in the process of returning this item as it is a big disappointment. Not worth the money. Response from DR SupportWe thank you for posting your review and we're sorry that the Rotohog Tiller hasn't performed to your expectations. It should definitely do the jobs you describe. As Soil conditions are different for each user, the best way to determine the correct speed & depth is to listen to the Engine on the Tiller. If it starts to bog, you either need to slow down or raise the Tines some. Of course, if the Engine isn't running properly that would affect the performance also. We will have someone contact you soon to offer assistance in getting your Rotohog running right. this tiller works great in the old garden!! with the addition of the ground stakes i'm able to break up new ground that has not been worked in 10+ years. this machine has only two flaws. with the use of ground stakes one is a little harder to get off, have to remove a bolt.and would like to have a larger engine. but all in all if i like the machine. with the hard clay and rock quarry that is my garden it has done a better job than 3 point hitcher tiller behind a large tractor. I got this for my dad. He has been using it although he say's it works well on the ground that's already tilled but new ground it doesn't go deep enough. Dad has had two knee replacements and it' hard on him to stand behind a regular tiller so this is good for him. I bought the landscaping/food plot package and it is a great tool to use at my cabin. Takes all the hard work out of the job. Tilling made easy from my lawn tractor. Tilled fairly large garden spot with ease no back breaking work an when done not tired are wore out. We enjoy our roti-hog it takes the work out of gardening. Only problem was broke a belt and dr replaced it at no cost. I like the way it tills up my field and any area I want to till. This tiller will do a great job however you must start out very slow, start at a shallow depth and very slow speed and work your way deeper. The only engineering flaw I found is that the bracket holding the starter coil which grounds the unit is very weak and mine broke after a few uses. The ROTO-HOG works very well for our garden. I've used it with the HILLER attachment and the CULTI-PACKER and was very pleased with the results. The time and effort it saved made it well worth the amount spent. I'm so pleased with the quality of the products that, in time, I plan to purchase additional DR products. Perhaps overmatched towards what I needed initially but certainly formidable. When towing behind I didn't take into account the turning radius required and therefore had dificulty in turning, even "Y" turns were challenging. When/if I expand the plot the equipment will more than suffice. Excellent quality product and otherwise easy to use. This tiller is well made but in my view, is a little under-designed. I live in an area of heavy clay soil. It is easy to stall the engine on the tiller, even if I am trying to carefully set the tilling depth and forward speed to avoid overloading the engine. My garden area is large enough that I can keep the tilling depth at one setting while making my passes around the garden, but it still is common to overload and stall the engine. It would also be helpful if there was some kind of simple tilling depth indicator to use for reference in setting the tilling depth. It would also be heplful if the lever used to engage or dissengage the tines was longer so it could be moved without dismounting from the towing vehicle. I use a John Deere L130 lawn tractor to tow this tiller and the brakes on the tractor are inadequate to control the forward push that results when the tines encounter firmer or denser soil, the tractor tends to lunge forward which also causes the tiller engine to stall. Response from DR SupportThank you for posting a Rotohog review. We appreciate hearing from our customers about how the products are performing. We will pass the information along for future consideration. There is a Drag Stake Kit available to help with the holding back of the Tiller for lighter tow vehicles. Good features, easy to attach and use. Price is a bit high but a good product for the money. The Roto-Hog Tiller is a superb piece of equipment. I've used the Roto-Hog for one year now and it does an excellent job. Follow the instructions for usage on soil moisture and it works up fine garden spots. I like it and appreciate the quality of the equipment. As on all equipment that works hard be certain and check the oil each usage and add some when it is needed. This is a hard working machine. I purchased the hiller attachment for it this spring and it is such a great addition to the tiller that I wish I had gotten it when I bought the tiller originally. excellent for medium to large gardens. Performs real good. I recommend this product for its overall performance and quality and ease of use. I think this ROTO-HOG is great, This is my second year of using it and it has done a well job. This product takes the place of a tractor. I love my Roto-Tiller. It does the job of a tractor at a fraction of the cost. Love it! The Roto Hog Tiller makes tilling extremely easy and much quicker than a walk behind tiller. You can till, spread seeds and pack all with one machine. You will be very pleased with this product and you will use it many times. I recommend it highly. We have the electric start and the controls for letting the tiller up and down are very easy, right at your fingertips. I have owned numerous tillers in my life. I always regretted spring tilling because I usually ended up all beaten and exhausted from the various tillers I have owned. We just moved to Missouri from Alaska and knew we are going to have lotos of gardening to do. The DR tiller makes it an enjoyable experience and I don't finish the experience all beaten up. I do need to order the drag stake kit since the tiller will just push my tractor down thwe hill if i try to dig too deep or the ground is hard. I have a very large garden which requires the use of my tiller. This tiller is a good product, with the exception of turning and rounding corners, especially around staked plants. Otherwise, I would recommend this product. It need a more powerful engine. It does not break & till ground as good as the video shows. Too much money for what I got. I have to turn plow with my big tractor first, then till as slow as I could go. I wish I had bought a 3 point tiller for a catergory 1 hitch. Response from DR SupportWe Thank you for posting a review. The ground composition will determine the depth you can till at. If you are breaking new ground you need to take 1"-2" passes at a slower speed to get it broken up and then you can start to go deeper & faster. We love our Tiller it make it easy to work the garden. I am very happy with my tiller. I have told others about how esy the tiller works. it turn easy I have bad knees the tiller is easy to walk behind. I also have the batter pack chain saw & blower. My wife & I take on 4 wheeling trips with aou chruch group. A lot of the were suprise how well it work. Our pastor may be calling to get the chain saw. If you want to work a large garden this is the ticket. I purchased this tiller last year. We grow almost all of our vegetables and meat. I am an amputee and needed something more than a walk behind machine now. The Roto-Hog was just the ticket. We have rocky hilltop clay soil and the Hog handled it without hesitation. I would recommend the hog to anyone. The Roto-Hog is easy to use and well built. The Roto-Hog is ease to use - it starts easy with the electric starter. It is heavy duty and much easier on the physical stress than using a walk behind unit. I have sheared a shear pin and they are easy to replace. This unit is great for gardens or with wildlife food plots. It is easy to pull with a lawn tractor and the tongue hitch reduces vibration and pull-back on the tractor. Q.why were these units re-conditioned? Are they demos, returns, warranty units? A.Reconditioned machines are offered at a reduced price and come with the same standard warranty as new machines, including the DR Trial Offer. They are returned to us under the terms of the trial period, where if you are not fully satisfied, simply send the machine back for an exchange or a full refund of the product's original price (less the standard shipping charges to and from your delivery address). Reconditioned machines are thoroughly checked by our mechanics and cleaned up and tested. If you are interested in purchasing a reconditioned machine, we recommend calling directly to speak with a Sales Representative because availability is on a first come first serve basis and inventory can vary. We are unable to offer reservation orders or waiting lists for reconditioned machines. Please call 1(888)550-0062, Monday thru Friday, 8:00 am to 8:00 pm, Saturday, 8:30 am to 5:00 pm, and Sunday, 9:00 am to 5:30 pm, Eastern Time. A Sales Representative will be happy to assist you. Thanks for your inquiry. Q.I have 2 acres that is mostly clay. I bought a tow behind that attached to my pto. After making 3 pass's the tines went in about an inch. The dealer took it back. Will your unit do a better job? A.The Roto Hog easily attaches to a Lawn Tractor with a minimum horsepower of 12 hp and can also be used with a 300 cc ATV or a 250 cc ATV, but you would need to purchase the drag stakes. The amount of time it would take to till an acre or two would depend on a few different factors. What it's being pulled with, how fast you are going, how deep you are tilling, condition of the soil and whether or not the ground has been tilled before. With clay, it may be a challenge to break it up and it may take a few repeated shallow passes. You may want to give our Sales Team a call to discuss your particular situation with a Sales Rep. Sales can be reached at toll free 1-888-550-0062. Also, if for any reason the Roto-Hog Power Tiller does not work for your application and you are still within your DR Hands-on Trial Period, you can send it back for a full refund of the product's original price, less the standard shipping charges to and from your delivery address. A.Certain engines are no longer rated with horsepower as a frame of reference for power. They are rated by foot-pounds of torque. Rating by foot-pounds of torque is a trend that is spreading throughout the industry because it is a more accurate measure of power. Our machines are fitted with engines that are more than powerful enough to do the work they were designed to accomplish. Q.We are thinking of using this to remove grass that grows into our clay Little League fields. Do you think this has adequate power to do this? A.The Pro model of the Roto-Hog Power Tiller will have the power to till the grass and any weeds on the clay fields. With clay, it may take a few repeated shallow passes, but with the remote control you can lower the tines, tilling shallow or deep, depending on the conditions. Q.Can the travel wheels be fully retracted so they will not roll through the plowed soil? A.The Pro Roto-Hog Power Tiller has a control box that contains a 3 position momentary rocker switch. The "raise" position raises the tines and lowers the wheels. The "lower" position lowers the tines and raises the wheels. When you release the switch, it will return to center or the off position. Q.What amount of HP is needed to pull a Roto-Hog 9.00 tilling 4-5" deep in clay? A.We recommend a 12 HP lawn tractor or larger for towing the Roto-Hog and using the Drag Stake's with tractor's of 12-16 HP. Q.What is the shipping container's dimensions, especially the height? A.Below are the shipping dimensions and weight of our 9.00 Tow-Behind Roto-Hog, 48" L x 40" W x 33" H, Manual Start - 310 pounds, Electric Start - 320 pounds Thank you for your inquiry. Reason for asking question: When lowering the tines to the tilling depth, soil is thrown back three to four feet. A removeable deflection shield could greatly reduce the amount of soil that is lost or having to be raked back plus it would help to keep the soil in the tines to further break up the slices of the intial cuts. By the way, I live on the Upper Texas Gulf Coast. Our soil type is alluvial, also known as gumbo. It is very rich in nutrients, but if not kept tilled and aerated, can become hard as concrete until it gets wet and then can be like quicksand. A.Unfortunately we do not currently have such an attachment. I have submitted a request to have this looked into by our engineering and product management departments. We always appreciate feedback from our customers to help us advance our products. Q.Do the reconditioned units have one year hands on? A.The reconditioned Roto-Hog Power Tiller is a DR branded machine and comes with our standard two-year warranty and our DR Hands-On Trial Period. Reconditioned machines are available on a first come, first serve basis, so we generally recommend calling directly to speak with a Sales Representative to check on the availability of a particular model. Our Sales Department can be reached at toll free 1-888-550-0062. Thanks for your interest in DR Power Equipment. Q.will it cultivate an existing food plot? will it break up sod? A.The DR Roto-Hog will cultivate/break up sod very well. Tilling a full 3-foot swath, it is ideal for strategically placed food plot's. Q.Will this till brush roots? Just cleared some land, and a lot of brush roots are there. A.The Power Tiller will till unbroken ground and tough sod. If your area has a lot of brush roots, the tiller will hit and bounce off the roots, but it will not till them. With the smooth-track pin hitch attached to your tractor/atv, it absorbs bumps and hits from the tines hitting rocks or roots. There are shear pins on the tine shaft which are designed to break it the tines hit an immovable object to protect the engine and the engine shaft. Q.May I ask the actual towing weight of the Landscaping package & if the hitch is a standard 2" ball? I realise the RotoTiller will sort of power itself, but what will the weight become as a complete Landscaping package (Roto, Spreader & Cultipacker)? A.The Landscaping package will add 122lbs. The Spreader weighs 35lbs. The Cultipacker weighs 87lbs. The Hitch is a Pin Hitch, not Ball. Q.can you till and make a furrow at the same time? A.The Hiller Kit (26087) is used to make hills for planting. The tines are removed from the Rotohog Tiller and replaced with the Hiller kit. Q.what direction do the tines turn?, can you reverse them to turn the opposite direction? One of the reviews said that the tiller pushed his lawn mower forward, and that was hard to control. Can you explain what he might mean by that? something about his brakes not being adequate to stop him. My wife is going to be using this tiller, and it has to be wife friendly. Q.Even though the unit is equiped with electric start--confirm that the motor still has pull start capeability. The remote raise/lower operates with a battery, is there anyway to raise or lower the unit manually in the event the battery no longer has power??? The DR Tow Behind Roto-Hog Tiller does have a manual start back up as well. The remote is the only way to raise and lower the tines, there is not a manual way to adjust them. Q.Are all parts, battery, & accessories covered under the extended warranty if purchased with the Roto-Hog? A.The standard two year residential warranty and extended warranty for both the machine and engine for the Tow-Behind Roto-Hog Power Tiller covers all but the wearable parts. A.The Premier model is only available in Manual start. The Pro model has an electric starting option. The Pro also has more tines and the tilling depth between the 2 models varies. The Premier model needs to be manually adjusted as well. The Pro model uses a remote for this feature. There is also a difference in price. Q.If I buy the Pro Model Tiller only, will I be able to add the landscape package later? A.The Landscaping/Food Plot Package includes the spreader and culti-packer attachments. If you choose not to order the package, the attachments can be purchased separately at a later time and they will ship by UPS Ground Service right to your door. A.Yes, the Hiller Attachment is still available, here is the web page. http://www.drpower.com/power-equipment/roto-tillers/ You can also give us a call at 1-888-550-0062 and a sales rep will assist you. Trent, thanks for the total weight answer but does this mean a towing weight of 122lb or is that a dead-weight? I would expect when the RotoTiller is in operation, because of the self-propelled nature of the unit, the actual drag-weight would be less. This is important since not all Lawn Tractors (as illustrated on your various pages), have the capabilities for towing much of any substance. It also begs the question as to whether the Husqvarna tractors which DR are promoting, are also capable of such? If not, I think some written proviso should be made on the DR site. A.That is the dead weight. As for towing options. You will want a Tractor/ATV with a weight of 400LBS or more. The Rotohog tines go in the forward direction and can push smaller (Lighter) units. We do have Drag Stakes in case this becomes an issue. The smallest Husqvarna Model we currently sell (22HP, 42") weighs 522LBS. Q.How long is the cord for the remote? A.Thank you for your question our Roto-hog. The cord on the Pro Roto-Hog is 72 inches from the hitch. This gives an adequate length for towing with most lawn tractors and ATVs. Please let us know if you have any other questions. Q.Will a 19 hp riding lawn mower pull this unit? Yes, your 19 hp riding lawn mower will be able to pull the DR Roto-Hog Tiller very well. Q.Which way does tines turn? A.The tines on our Roto-Hog turn in a forward motion. This helps propel the machine forward while tilling. This is a great machine for maintaining existing plots or breaking new ground. Q.What is the diameter of the transmission shaft for the tines? A.The diameter of the Transmission Shaft is 1". Q.what is the drag steak kit for the roto hog? and how does it hook up? A.Drag stakes are basically used when you are towing the machine with a smaller lawn tractor. The tines of the machine are propelling it forward, and the drag stakes help hold the machine back, so as not to push your tractor. The stakes also help to break up hard, compact soil and gives a deeper penetration. There is a small plate that fits onto the frame of the tiller with bolts, spacers and nuts. The drag stakes slide into the plate assembly and are secured with a clevis pin and hair pin. A.The Power Tiller is equipped with an overhead valve Briggs & Stratton engine (9.00 Ft lbs of Torque) that will till unbroken ground and tough sod with no problem. The 24 Bolo tines can dig up to 7-1/2" deep and mix the soil completely. The curves of each tine minimizes the wrapping of vegetation. The amount of time it would take to till the area would depend on a few different factors. What it's being pulled with, how fast you are going and how deep you are tilling. A.We recommend using a SAE 30W HD oil in the DR Roto-Hog Power Tiller. The Roto-Hog has an oil capacity of 20oz. There is a maintenance kit available, item # 38043. The maintenance kit will include a drive belt, spark plug, air filter, oil, fuel stabilizer, (4) shear pins, and (4) cotter pins. You'll have everything on hand for your first tune up! Thank you for your question. Q.I have a 31h/p John Deere tractor, could I pull the DR Roto-Hog rototiller behind my tractor with no problem with out having to purchase a 4 or 5 foot tiller to run off my pto. or would my tractor be to big or to strong for the DR Roto-Hog? The Dr Roto-Hog will work very well behind your John Deere tractor. It requires a simple pin hitch set up. It tills 3 feet wide and 7 1/2 inches deep. Q.Do you have any DR Roto-Hog Rototiller which can run on Diesel or unleaded gas? Q.Does this model have the electric lift and local pick up? A.Yes. the Pro model Roto-Hog features an actuator for raising and lowering the wheels, which in turn raises and lowers the tines. The 12 volt battery can raise/lower 100 times before needing a charge. We offer depot delivery for customers who would like to pick up from a trucking depot in their area. We also offer home/business delivery as well as enhanced home delivery. A.You may place an order for the Roto-Hog Power Tiller belt by calling us directly. To place an order by phone, please call our Parts Department directly at TOLL FREE 1-888-550-0062, Option 2 or 3, Monday thru Friday 8:00 am to 6:00 pm, or Saturday 8:30 am to 5:00 pm, Eastern Time.